Dell has announced the Streak 7 tablet at its press conference here at CES as well as the new Venue smartphone. 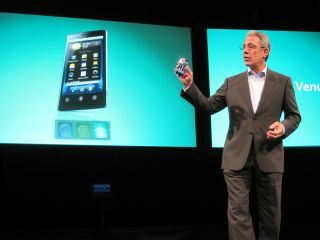 Both run Android 2.2 although the Streak 7 will be upgradeable to Android 3.0 Honeycomb "soon after its release." The tablet is very similar to the standard Streak (now seemingly known as the Streak 5). So if the new tab will be Honeycomb after a while, presumably the Streak 5 will be too. Dell also previewed a 10.1-inch tablet that will be on the market soon, although this shot really is all there is. And there was no indication of how soon "soon" actually is. The Streak 7 is the first 4G tablet in US on T-Mobile, while there's a dual-core Nvidia Tegra 2 processor. Both also have full Adobe Flash 10.1 support. Dell says it will sell the Streak 7 outside the US though, so it shouldn't be too long before we see it in the UK. The Streak 7 also packs the Dell Stage multimedia interface that a Dell representative told us will be on a huge variety of Dell and even non-Dell devices. Like the Dell Venue Pro, the new Venue has a curved glass screen and is very similar in much of its styling. Unlike the Venue Pro though, there's no slide-out QWERTY keyboard. Both the Streak 7 and Venue will be available "in the next couple of weeks" according to Dell. Initially the Venue will be sold unlocked on Dell.com.